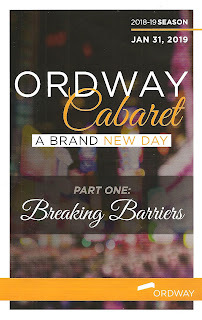 Where the Broadway Songbook was a lesson in musical theater history, the Ordway Cabaret is more about personal history. The nine talented performers (some familiar faces, some new ones) told true stories from their lives, about how theater has at times alienated them, and at times been a welcome home and safe space to be themselves. It's almost like a real life #TCTheater version of A Chorus Line, which was written based on interviews with Broadway performers. In this cast made up mostly of people of color, there was a lot of talk about representation, and seeing someone who looked like them on stage, which allowed them to imagine themselves being on stage too. This is why representation is so important, beyond the one token person of color, or woman, but real inclusion that allows everyone's voice to be heard, and allows everyone in the audience to see their stories on stage. It was a very entertaining show, but also incredibly moving as these performers opened up in a very real way. 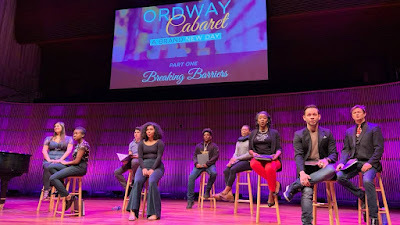 Each performer wrote their own story, curated by Rod Kaats, the Ordway's Director of Education Kelli Foster Warder (a choreographer who's also credited with staging the show), Music Director and piano accompanist Raymond Berg, and Aaron Wheeler. Performers Allyson Tolbert, Brianna Graham, Dane Stauffer, Fernando Collado, Ileri Okikiolu, John Jamison II, Leo James, Rudolph Searles III, and Suzie Juul each sang a song or two that's meaningful to them, along with some fantastic group numbers. It was a great selection of songs from musicals old and new, all of which related to the performers' stories and broke barriers in some way (see photo on the left). One common theme was interracial relationships (Showboat, South Pacific, and West Side Story), which Kelli gave us a little background about, and was further explored in the video clips of real life interracial couples (some of them familiar #TCTheater faces). This again brought the songs and musicals into real life and showed the impact theater and the arts can have on the world. They acknowledged that these musicals are flawed when looked at through today's lens, but also broke barriers in their own way at the time. 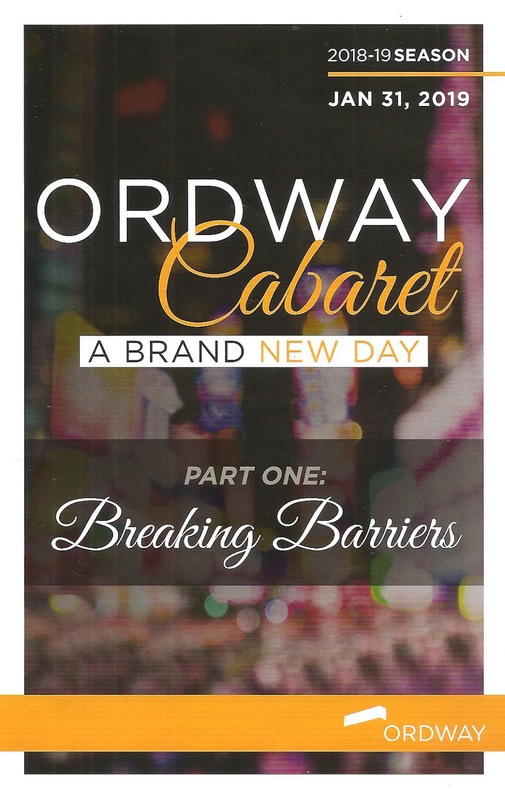 Mark your calendars for the next installment of Ordway Cabaret, A Brand New Day on May 2, titled "Rise Up! Protest on the Broadway Stage, from Hair to Hamilton." A couple other things I'm excited about seeing at the Ordway are the Broadway tour of the new revival of Falsettos in February, and the Ordway Original productions of 42nd Street this summer and Smokey Joe's Cafe (featuring the songs of Leiber and Stoller) in the fall.